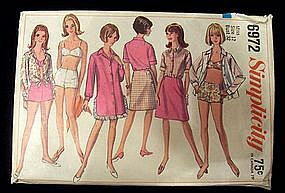 Simplicity printed pattern # 6972, Miss size 12, bust 32. Back of envelope reads: "Misses' bathing suit, back-wrap skirt and beach shift or shirt. Lined bra has shoulder straps and back button closing. Lined shorts made to be worn 7/8' below normal waistline has back zipper. Shirt or shift with optional button-down collar has front button closing and long sleeves gathered to buttoned cuffs. Shirt may be made with short sleeves. Shift has lace trim. Skirt without waistband has back closing"
Used pattern in good condition. Envelope is a little tattered at top.